The amount invested in the property sector constituted 0.44 per cent of the EPF's total investment of RM420 billion. The Employees Provident Fund (EPF) has invested RM1.89 billion in the property sector which in return contributed RM67.29 million to its revenue in the third quarter of this year. Chairman Tan Sri Samsudin Osman said the amount invested in the property sector constituted 0.44 per cent of the EPF's total investment of RM420 billion. 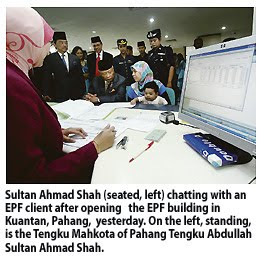 "As a pension fund which aims at providing a comfortable life for retirees, EPF's investments were made through a due diligent process to benefit the contributors in the long run," he said at the opening of the EPF Kuantan building in Bandar Indera Mahkota, Kuantan, yesterday. Sultan Ahmad Shah of Pahang officially opened the RM12.8 million building which was completed in March 2006. Present was the Tengku Mahkota of Pahang Tengku Abdullah Sultan Ahmad Shah. Samsudin said the EPF had also invested in other sectors and subscribed to the government's securities, bonds and equities and each decision was made after a thorough study to minimise risk. The approach has allowed the EPF to give competitive dividends every year, which was the main objective for the establishment of the retirement fund. As for Pahang, he said there were 168,000 active contributors in the state with a total savings of RM5.27 billion. Some 94,388 of them are in Kuantan with their savings totalling RM3.08 billion. Samsudin said there were 9,194 employers in Kuantan who contributed about RM42 million monthly to the EPF.